Pierre Schunck (*24-03-1906, Heerlen †02-02-1993, Kerkrade) was the eldest son of the Dutch businessman Peter J. Schunck and Christine Cloot. Already as a student, Pierre Schunck showed a social feeling. Or was it also his desire after an interesting life, that made him help in a gypsy camp in a Heerlen with a program to teach the children? This pleased one of the mothers so much that she promised him her daughter. This, however, never turned into something. For different reasons Pierre felt more attracted to become a priest. He completed his studies in Megen near Nijmegen and Hoogcrutz (at the southern edge of southern Limburg). But he left the monastery again before the ordination to priest. World War II has exerted a big influence on their further life. 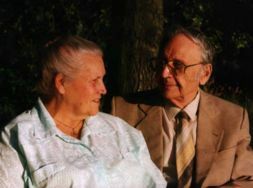 Due to their moral and national convictions, Pierre and Gerda saw only one possibility: to stand up against the German occupation. So, he became "rayonleider", area leader, of the L.O., "Landelijke Organisatie voor hulp aan Onderduikers", national organization for help to persons in hiding, in Valkenburg under the pseudonym Paul Simons (they got a pseudonym with the same initials like the real name, because at that time, more than today, it was usual to have initials in clothing and tissues). A Jewish person in hiding with the „treacherous“ (see Note below) name of Lex Israels, who was until then completely unknown to them, was provided with documents and got a job in the „Mill“ in Heerlen, where he was the managing director. From this, a lifelong friendship has originated. Another person in hiding and momentary guest in the house Schunck was a chaplain Berix from Heerlen, the district leader of the local L.O. under the resistance name Giel. He didn’t remain long, maybe because he didn’t want to endanger the family with five small children. A little time later the Germans arrested him during a meeting of the L.O. in a cloister in Weert. He shouldn’t return alive from the concentration camp in Bergen-Belsen. Allied pilots, who crashed in the area, were put on the "pilot line" to Gibraltar. "Divers" (persons in hiding) were equipped with phony or stolen food cards so that they could survive. Diving addresses had to be found and to be checked on their reliability. Of course these actions were involving risk of life. Once, police came to dig in the garden for suspicious things under the management of a German SD-man. In the justifiable hope on a reward, somebody had given a hint. Due to the goodwill of a Dutch police-officer, who supposedly couldn’t find a thing this has turned out well. All these troubles concerned copper taps from the laundry, that had been kept back. But also this was considered sabotage. After war life went on: money had to be earned. Meanwhile Europe and the world were confronted with a new conflict: the cold war. Fearing the expansion of Stalin, some relatives, among whom including Pierre’s father, decided to bring their money into security to the Dutch Antilles. Pierre got the order to establish a clothing factory there. Here became a victim of his resistance time: he appointed a former resistance man as confidential clerk without noticing that he had to do with an untrustworthy adventurer. Finally, the business became a fiasco. Nevertheless, he has entered a big success with it on a quite other level: a first important step was done with the extermination of the unemployment on Bonaire . Before, during and after the adventure on Bonaire, Pierre still remained some years in the service of the company Schunck in Heerlen. There, he managed "Schuncks Kleding Industrie Limburg" or "SKIL", in which particularly working clothes were produced. This business was accommodated in a former mill, and still known also under this name. But it was too small and in the long term unprofitable, so it was liquidated. After that Pierre started up in Maastricht an independent men’s and boy’s clothing store Schunck Jr. at the Muntstraat 41. After retreating from the active professinal life, he dedicated himself to his old love: weaving. He lost himself in doubleweaving with four shafts. With us only few people master this kind of weaving. The traditional Coptic double tissues had his particular interest. Even the authors on double weaving apparently sometimes copied all the same mistake of each other, for example about the position of the pattern slat. He connected his love to weaving with his other big passion, history, by restoring old looms and arranging exhibitions on weaving, both with the help of his son Arnold. It was not only because of his hobby, that he undertook wide trips, among others to the Otavalo indians in Ecuador, who are famous because of their woolen tissues. Pierre Schunck died, after a short and merciful throes in Heerlen at the 2nd February 1993. Note. Originally the word treacherous means : „someone or something that will or could betray you.“ Of course this is how it is meant above (in conjunction with the name Israels for a Jewish person in hiding) and I don’t find a better word for it. Depending on the context, of course, this word has got derived meanings: „dangerous“ (eg treacherous curve) or, in the case of persons or acts: „sneaky“ or similar. Somebody out of my family appealed to me on this word, fearing that either nazi sympathizers could understand it different from its intention (which does not interest me at all, however, because these people always understand everything wrong anyway), or people with Jewish roots, who almost certainly have lost relatives in the extermination camps. They could feel hurt of it. That would surprise me, but of course it is possible. I would like to hear from them, although I mean to be clear enough. I repeat it here once again: this is about „treacherous“ in the original meaning, and I don’t find the last name Israels sneaky or worse. But simply dangerous at that time: he would be betrayed by using it. So if somebody should feel hurt by this word personally (and not on behalf of others, as outlined above), despite the strong statement how it is meant and that I don’t find a better word for it, then I like to hear from you. However, positive reactions are always welcome too. To do this go to the contact page of this site. Click on one of the titles for the unabridged, uncurtailed Dutch text or the German translation. .